"What he gave the horn, it gave back. What it gave him, he never forgot." The ultimate reading day for me includes the following: rain (which we get a lot of down here in the south), a cup or two or three of strong black coffee (no pods -- I love freshly ground) and most importantly, the jazz music playing in the background. 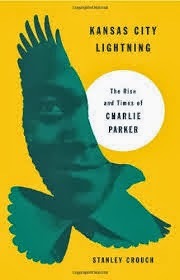 One of my favorite musicians is Charlie Parker, about whom this book was written. I have been wanting to read a biography about Parker for a long time; when Kansas City Lightning was published last year, I scooped it up. But here's the thing: this is less of a biography than I thought it would be. At first I was disappointed, but I kept flipping back to the book cover with its subtitle "The Rise and Times of Charlie Parker," and came to terms with the fact that a standard biography was not the author's intention. I say that up front so that if you start reading and Parker disappears for long periods of book space, don't despair and keep going. The end product as a whole is informative and frankly, quite a ride, one not solely for the jazz lover. It also speaks to African-American culture of the time, and expands out into a look at blues, swing and jazz in the context of a wider American culture. You can read more about this book here at my nonfiction page if you're at all interested; for the jazz lover it is a definitely no-miss.